Getting through a chemistry class involves a range of science skills and procedures. You use exponential and scientific notation, analyze atomic structures, name compounds, convert to and from moles, and draw Lewis dot structures. Is there anything you don’t do in chemistry? For addition and subtraction: Use exponential notation to express both numbers using the same power of 10, and then do the math. Round the sum or difference to the same number of decimal places as held by the measurement with the fewest decimal places. If your answer isn’t in scientific notation (the first number in your answer isn’t between 1 and 10), convert as needed. For multiplication and division: Express both numbers in scientific notation so you can clearly see how many significant figures each number has. Round the product or quotient to the same number of significant figures as held by the measurement with the fewest significant figures. Does the formula begin with an H? If so, the compound is most likely an acid. Use the rules for naming an acid. 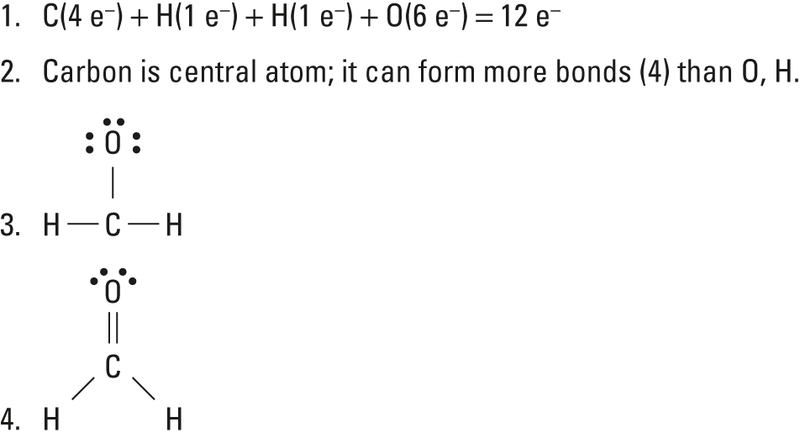 Does the formula contain a metal (not hydrogen)? If it doesn’t, you need to use prefixes when naming because you’re dealing with a molecular (covalent) compound. Be sure to change the ending of the second element to -ide. If there is a metal, you’re dealing with an ionic compound — proceed to Step 3. Is the cation a transition metal (Group B) or a metal with a variable charge? If the cation is a Group B metal (or other metal of variable charge, like tin), you need to use a Roman numeral to specify its charge. If the cation isn’t a transition metal and you know the charge, you don’t need to specify the charge. Is the anion a polyatomic ion? If so, you write the name of the polyatomic ion. If the anion isn’t a polyatomic ion, you use an –ide ending.